Cool and creative advertisements inspired by mirrors by various companies from all over the world. Dove Bodymilk Mirror Advertisement: To promote 'Dove Bodymilk' to the customers in the hotels in Frankfurt, markers that uses a de-mister fluid were used to write messages for the guests on the bathroom mirrors; the writing would appear when the mirrorsteams up and its a real moment of surprise to give Dove Bodymilk a try. Maserati Mirror Advertisement: To promote Maserati Pre-owned program a leaflet with information about it was attached to the side mirrors of selected cars parked at exclusive events. Tattoo Mirror Advertisement: Stickers of tattoos were placed in bathrooms and on changing room mirrors throughout Auckland. 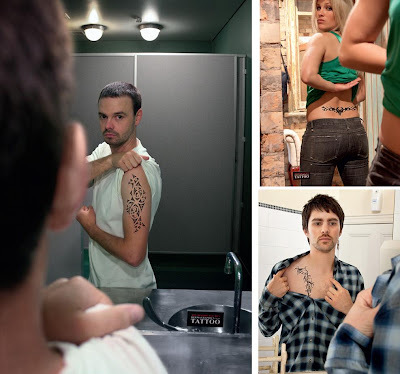 People could line up the tattoos in the mirror to give the impression that they were actually on their skin. Samsung Video Camera Mirror Advertisement: The idea was to enhance the main benefit of Samsung camcorder that it records for a longer time as it saves video in DVD format with dual layer. 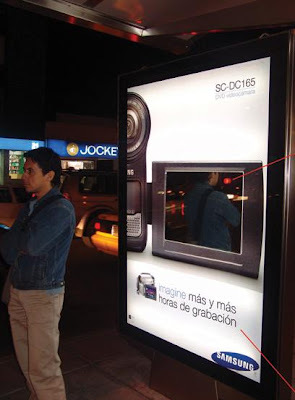 To show this in an economic and practical way, a mirror was used in place of camera's visor; as everything reflected in the camera's visor looked real, people on the bus stop interacted with the camera and felt as if they were being filmed. Fantastic Four Mirror Advertisement: Four mirrors were placed in the main movie theaters around the town of Sao Paulo, Campinas, Rio de Janeiro and each mirror reflected the "super power" of the movie's characters. 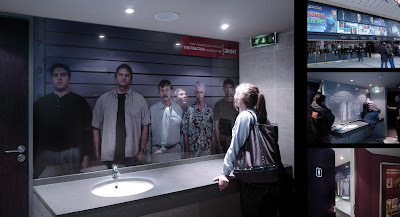 TV Channel Mirror Advertisement: To promote a TV show a two-way mirror effect was created in theaters. Rikkis Taxi and Shuttle Mirror Advertisement: To promote that their taxies and shuttles are reliable, company's direct-line phones were installed along with extra large posters that were specifically positioned in restrooms of popular restaurants around Cape Town. When viewed in the refection of the mirror above the washbasin, it gave the viewer the impression what would be next if they aren't responsible. 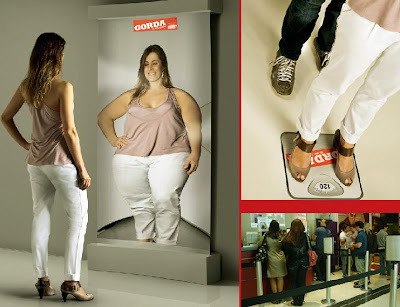 Teatro Procópio Ferreira Theater Mirror Advertisement: To promote the play "Fat", mirror that distorts images were placed in the theater lounge to make people reflect 'how does someone who is visibly overweight feels?'. Apart form this weigh scale floor stickers were placed that displayed 120 kg; so in a relaxed way, people could literally be put in the main character place. Landrover Mirror Advertisement: A creative advertisement uses windscreen sticker on the mirror of the locker rooms to give viewers a feel of them being in a Landrover. Kangaroo Cabs Mirror Advertisement: These mirrors looked like any other ordinary mirror but transformes its image when a person went closer to it and the text reads: 'Take a cab'. Cola Light Mirror Advertisement: To promote more people to purchase cola products when they were in a small range of the vending machines, mirrorfoil was wrapped on the rounded multiplex area where usually cola has his own advertisement. Due to the rounded form of the vender, the mirror changes the viewers' perception and shows a thinner version of him or her. 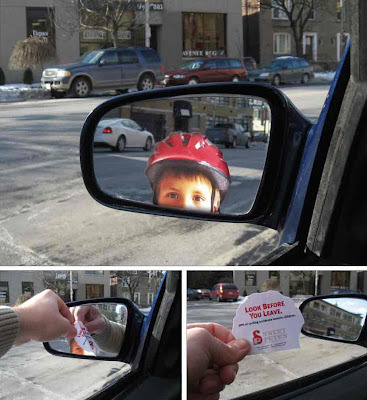 Bike Month Mirror Advertisement: To promote the bike month, clear decals were placed on side-view mirrors of parked cars. 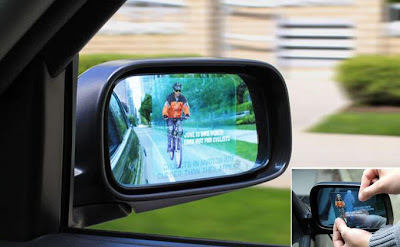 Bike Shop Mirror Advertisement: Peelable stickers were placed on side-view mirrors of parked cars to remind motorists to look before they pull out. 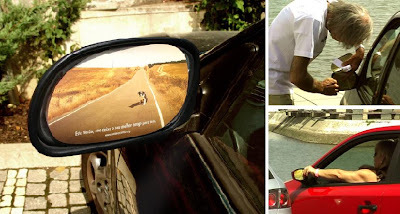 Dogs Mirror Advertisement: Stickers were placed on side-view mirrors of parked cars in Lisbon, Portugal with message 'This Summer Don't Leave Your Best Friend Behind'.